Unless you’re lucky enough to always fly business or first class, traveling can be a relatively uncomfortable affair. Terminals can be long, airplanes cold and seats extremely tight so you have to contort yourself to sit. That’s why having some travel essentials when it comes to clothing, accessories and shoes can really make a huge difference in how you feel en route and once you get to your destination. Here are some items I love to travel with and recommend wholeheartedly. 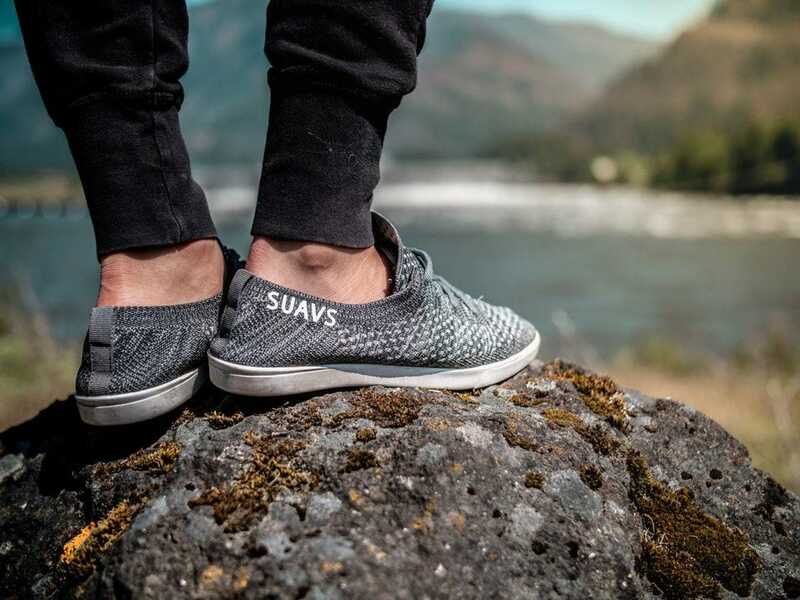 Designed in Austin, footwear brand SUAVS has created the ideal travel shoe. Their sneakers are lightweight and easy to pack if you’re debating whether to bring a pair of kicks with you these ones make it easy to say yes. If you decide to wear them on the plane you’ll love their flexible rubber soles that offer grip and move with your feet. Nothing like stretching your feet after a long flight right? Because they have sweat-wicking technology you can wear these with or without socks. This is especially great if you’re going from a cold to hot climate. And don’t worry about getting these dirty, you can just pop them in the washing machine to clean. I received a Henrik Vibskov Scarf as a gift a few years ago and now I can’t imagine traveling without it. It’s the perfect blend of soft and stylish and keeps me warm on the plane or when I arrive at a chillier destination. This brand’s scarves are unisex, typically made of wool blends and feature cool fringed edges. Leave it to a Danish brand to create a fashionable cold-weather accessory that you can use anywhere, especially an unexpectedly cold plane. In my opinion sweatpants are okay to wear to travel as long you don’t look like you’re wearing pajamas. You’ll want to wear something soft yet fitted so you’re comfortable but don’t look like a slob. Sundry Sweatpants have strategically placed design elements like stars or stripes that make them stand out and decidedly more day than nightwear. The brand embodies coastal casual and is equally nice to wear when you’re heading to a beach vacation or a new metropolis. This sleep mask is perfect for a bright flight because it truly covers your eyes unlike the flimsy eye covers most of us have. Made of breathable cotton this mask is soft and doesn’t press on your eyes. There’s an anti-slip back gel that prevents it from moving around and the Velcro is adjustable to adapt to your face. By creating blackout darkness you’ll be able to get great sleep even if you’re sitting next to someone who’s using their bright reading lamp. I like this mask because it allows my eyes to feel rested without the residual pressure I experienced with other masks. My friends joke that I should get a commission from recommending this pillow so much (I am in no way affiliated with this brand, just a fan). It’s true, I tell everyone who will listen about this pillow because it’s easy to pack and takes up little space. Because it’s inflatable it can develop into a full-size pillow that makes it easy to sleep on, especially in a window seat. It’s listed as a foot pillow but with its even, square shape, you can use it for your head. It’s easy to wash and once you’re done sleeping you can just pack it up and put it back in your bag. This is a more sanitary and less annoying way to carry a pillow around. Instead of it taking up space or worse touching a myriad of surfaces en route, you can only use this one when you really need it to sleep.